After buying that PRS... 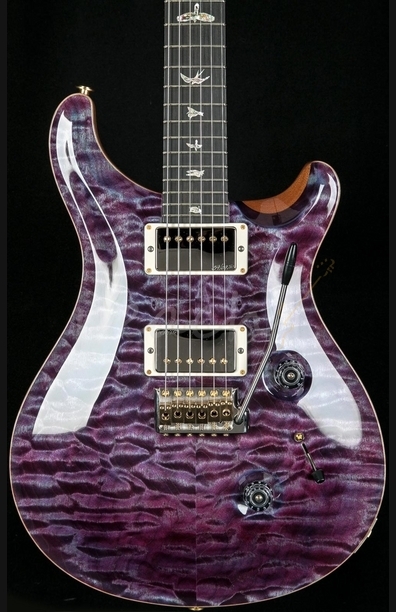 I came upon practically the same model but with a different top (violet burst), different grade wood (wood library - higher grade, apparently) and different pick-ups (59/09s). I bought this online knowing that it was going to pretty much be the same as my orange one, knowing PRS quality control. The top is stunning. When it hits the light it takes on so many different tones (see pics later). Honestly, I could just buy these guitars forever with different tops. The hardware is "mixed" on this (some gold in colour, others silver) which looks great. The headstock is a nice classy colour (see pics) and the lampshade knobs are transparent (not orange like on my other model). Everything else is the same. Because it would be so expensive to find another like this I don't think I'd ever sell it - it's just too good! I'm not making things easy for myself....! I should weigh them both as I think (and I may be talking rubbish) this violet one is a tad heavier than the orange one. The birds on this are also slightly more purple.... Honest! See my other PRS thread for videos. Even matches the drum kit! Very, very, very , very NICE! High praise, thanks! See this forum section for a review of my orange one - my fave ever guitar. I need to do a review for the Suhr. @DLM I just need a green one to go with them..
Oh come on! It's purple, has a quilt top, birds and bling and some of the hardware is gold ffs!! Have you seen this thread?! Very nice - apart from those dreadful nasty looking open backed machine-heads...what in goodness name is all that about?!? !